One of America's first theme parks was in the D.C. region — and two roadside remnants will soon be moved. ELLICOTT CITY, Md. 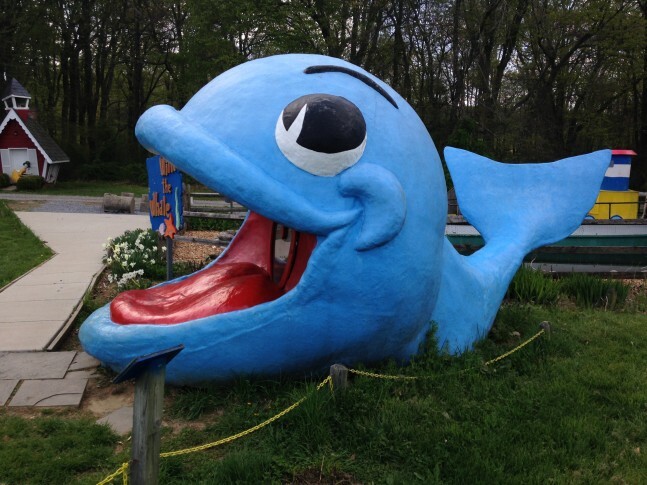 — One of America’s first theme parks was in the D.C. region — and two of its roadside remnants will soon be moved. Disneyland opened in July 1955; the Enchanted Forest, in Ellicott City, Maryland, followed just one month later. The Enchanted Forest closed in the ‘80s, and the rest of the property was turned into a shopping center. Many of the attractions were fenced off behind the shopping center’s stores, but that hasn’t kept people from visiting the ruins tucked away in the woods. The castle-shaped park entrance and the sign that looks like a storybook still stand proudly along Route 40, but in the next month or so, they will be moved. Martha Clark, of nearby Clark’s Elioak Farm, has already collected more than 100 items from the Enchanted Forest and made them available to visitors on her petting farm. The castle and sign will join the collection. “Route 40 is not going to be the same without the Enchanted Forest castle on it, and I’m going to miss it there as much as everybody else will, but if it’s got to go, I was more than happy to be able to provide it a home,” Clark says. She adds that it may be a challenge to get the castle to the farm. “That’s a major building. It’s made out of concrete block, and it’s going to be a real job to move it, but we’re ready,” Clark says. The lute-playing dragon that is usually perched atop the castle has already been moved to a behind-the-scenes barn at the farm. “It gives us a chance to paint him and refurbish him while he’s down on the ground,” says Clark. Ole King Cole, a statue that used to stand on a pole at the park’s entrance, was integrated into the Enchanted Forest Shopping Center sign and will stay where he is. There are also plans to add a new sign at the shopping center detailing the history of the site and pointing the curious to the farm. Clark says two other structures at the park’s original site — the Cinderella Castle and the Gingerbread House — are so dilapidated that they are set to be torn down. She’s been asked to try to save the giant ice cream cone that tops the Gingerbread House, but it’s not clear whether that will happen. Clark began rescuing parts of the Enchanted Forest in 2004. “I just thought it was a dreadful shame that these pieces were falling apart and deteriorating behind locked gates and closed doors. The Enchanted Forest is such an important memory in so many people’s lives in this area,” Clark says. This year marks the 60th anniversary of the park’s opening, and the Clark’s Elioak Farm is planning a special celebration Aug. 15 and 16. “We’re going to have a big day of all kinds of activities going on, we’ll have dignitaries hopefully, and costumed characters and family members from the family who owned the Enchanted Forest.” All former employees will get free admission to the farm that weekend. Clark says she’s determined to preserve as much of the theme park as she can for as long as possible.